Mass international migration is a response to extreme global inequality, and immigration has a profound impact on the way we live. Yet our views - and those of our politicians - remain caught between two extremes: popular hostility to migrants, tinged by xenophobia and racism; and the view of business and liberal elites that 'open doors' are both economically and ethically imperative. With migration set to accelerate, few issues are so urgently in need of dispassionate analysis - and few are more incendiary. Here, world-renowned economist Paul Collier seeks to defuse this explosive subject. 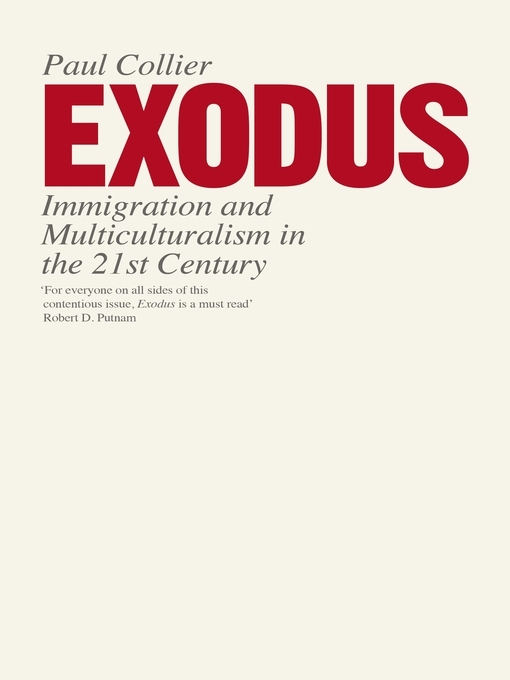 Exodus looks at how people from the world's poorest societies struggle to migrate to the rich West: the effects on those left behind and on the host societies, and explores the impulses and thinking that inform Western immigration policy. Migration, he concludes, is a fact, and we urgently need to think clearly about its possibilities and challenges: it is not a question of whether migration is good or bad, but how much is best? Paul Collier is Professor of Economics and Director of the Centre for the Study of African Economies at Oxford University and a former director of Development Research at the World Bank. He is the author of, among others, the award-winning The Bottom Billion and The Plundered Planet.